What are the games and players to watch as the Championship moves past the opening weekend? After a record-setting opening weekend, USL Championship action returns on Friday night with two matches set to kick off this week’s 17-game slate. Jim McGuiness will lead the Charlotte Independence into battle for the first time when Indy Eleven visits Sportsplex at Matthews (7 p.m. ET | Matchcenter | ESPN+), while Louisville City FC looks to bounce back on the road against ATL UTD 2 (7:30 p.m. ET | Matchcenter | ESPN+). Saturday’s schedule will see Pittsburgh Riverhounds SC become the last team to open its 2019 campaign, as Bob Lilley’s side begins its 20th anniversary celebration with a visit to the Tampa Bay Rowdies (7:30 p.m. ET | Matchcenter | ESPN+). If you only look at the 4-1 scoreline, it would seem like Louisville City FC suffered the first stage of a championship hangover last weekend at North Carolina FC. The stats don’t tell that story, however, as the visitors held nearly 60 percent of possession and outshot NCFC 21-12. After wasting most of those opportunities, Louisville’s response on Friday night against ATL UTD 2 will be something to watch. A bounce-back road victory won’t come easy though, especially with the hosts riding high after winning their home opener against Hartford Athletic. Pittsburgh Riverhounds SC will be the last team to begin its 2019 campaign when Head Coach Bob Lilley’s side visits Al Lang Stadium on Saturday night. The Hounds will try to build on last year’s campaign that saw them finish third in the Eastern Conference but will face strong opposition from the Rowdies in their home opener. Tampa Bay opened with a 1-0 win in Memphis last weekend and will want to keep that momentum going in a match that I expect to have a low-scoring, playoff feel to it. 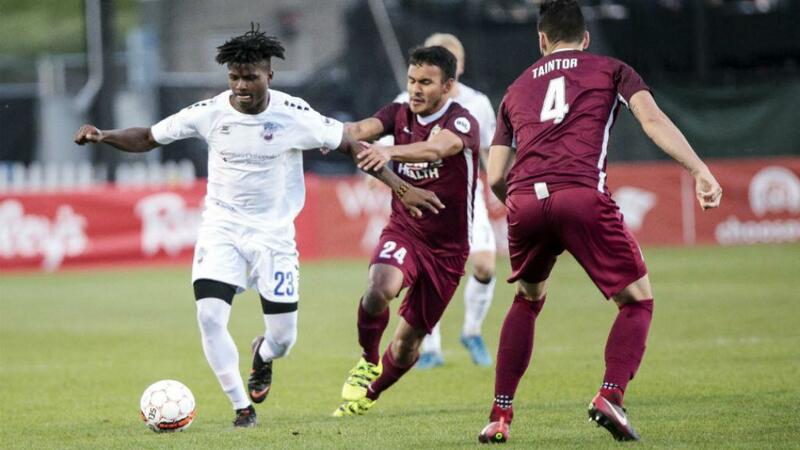 Colorado Springs Switchbacks FC matched North Carolina FC for the biggest Week 1 win and the side will look to make another strong statement when it hosts Sacramento Republic FC on Saturday. Shane Malcolm’s opening day hat trick set the tone for the Switchbacks, who will hope the USL Championship Player of the Week can continue his fine form against a stern Sacramento defense. After wasting plenty of chances to pick up three points against Real Monarchs SLC last week, Republic FC will look to find its shooting boots in hopes of grabbing a first victory of the season. The Four Corners Cup kicks off on Saturday at the Phoenix Rising Soccer Complex, with expansion side New Mexico United heading west to take on Rising FC. The 2018 USL Cup finalists showed plenty of resolve to battle back three times in a thrilling 3-3 draw last weekend in San Antonio, but Phoenix Head Coach Rick Schantz will want to see a better display at the back on his home turf. Meanwhile, New Mexico will try to build off its 1-1 draw against Fresno FC in its inaugural match, having let Devon Sandoval’s stellar strike get cancelled out early in the second half. With NMU supporters set to make the trip across state lines, you can expect some fireworks from this one. The last time Martinez played for the Independence, he scored 16 goals in 32 appearances and finished as the runner-up behind Dane Kelly in 2017’s Golden Boot race. After a season in MLS with the Colorado Rapids, Martinez makes his return to Charlotte under new Head Coach Jim McGuinness. If he can recreate the form that saw him earn All-League First Team honors in 2016 and 2017, the Independence can hang with Indy Eleven and other top teams in the East. I put Brown on this list last week and if you weren’t tuned in right at the kickoff, you missed a little bit of history. The Jamaican found the back of the net just 12 seconds into Energy FC’s opener against El Paso Locomotive FC, which clocked in as the second-fastest goal in league history. Brown has now scored nine goals in his last eight games including preseason, so I’m not betting against him finding the back of the net on Saturday against Las Vegas Lights FC. Last season, Brian Brown was charged with filling the cleats of Dane Kelly in attack for Reno 1868 FC. The Jamaican forward answered the call with 17 goals across the regular season and USL Cup Playoffs. Now, Brown is picking up right where he left off. The 26-year-old had a goal and an assist in his side’s 2-2 draw against Orange County SC last weekend and will look to carry that momentum into Saturday’s contest against Austin Bold FC. There’s plenty of attention going to Nashville SC’s front three of Cameron Lancaster, Daniel Rios and Kharlton Belmar – and rightly so – but LaGrassa was the best player on the pitch in Saturday’s 2-0 win over Loudoun United FC. The midfielder completed 62 of 63 passes and won 13 of 15 duels. If he keeps doing the dirty work and feeding the front three, Nashville should be able to repel the challenge of visiting Saint Louis FC. - Memphis 901 FC hosts the first meeting of two expansion sides when it welcomes Loudoun United FC to AutoZone Park on Saturday night. - Expansion teams went 0-5-2 on the opening weekend and five of them (Austin, Birmingham, Hartford, Loudoun, Memphis) are still looking for their first goal in franchise history.